This is a big digit thermo-hygrometer display console. It can be used as a standalone display, or additional console for the wireless system (add as many display consoles as you like to your existing system). Simple to read, simple to use, and affordable, the includes an indoor thermo-hygrometer in the console and can remotely read and update up to eight remote thermo-hygrometer sensors at the same from the large digit, uncluttered jumbo display. Eight additional wireless remote sensors can be added for comprehensive monitoring (not included). Optional temperature and humidity calibration is provided for the upmost accuracy. 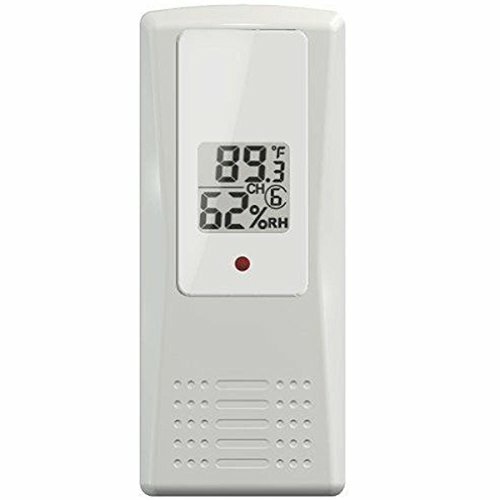 Applications: Measuring multiple temperature and humidity locations at the same time (both inside and outside), including different rooms of a house or building, drying rooms, humidors, and wine cellars. Indoor/Outdoor Humidity range 10% to 99%. Indoor temperatire ramge 32-140℉, outdoor temperature range 40-140℉. Line of sight wireless transmission (in open air): 90 meters, 30 meters under most conditions.